Radnor Hills are a British company based in the foothills of the Cambrian mountains in the Welsh Marches. Specialising in mineral water and soft drinks, the company has grown substantially in its 25 years of trading. Upgrade of an existing treatment facility with an AMBR LE™ and reverse osmosis system for treatment and reuse of process waters. Treatment of wastewater for discharge to the nearby river to meet with stringent consent parameters and reuse of water to the prescribed concentration values of the current Private Water Supply Regulations. 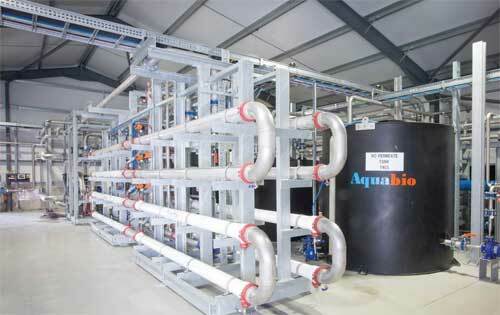 Bioreactor with jetox aeration, AMBR LE™ low energy ultrafiltration membranes, reverse osmosis and UV disinfection.